The German airship Graf Zeppelin starts a round-the-world flight. 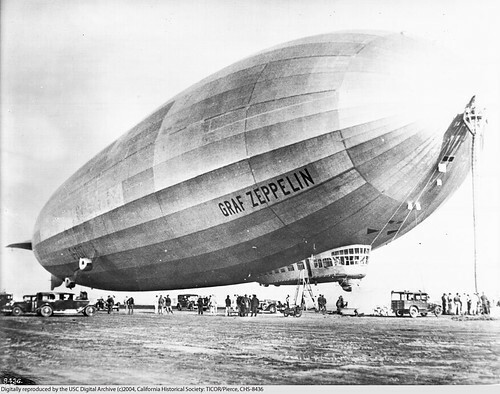 The growing popularity of the “giant of the air” made it easy for Zeppelin company chief Dr. Hugo Eckener to find sponsors for a “Round-the-World” flight. One of these was the American press tycoon William Randolph Hearst, who requested the tour to officially start at Lakehurst Naval Air Station, NJ. As with the October, 1928, flight to New York, Hearst had placed a reporter, Grace Marguerite Hay Drummond-Hay, on board, who thereby became the first woman to circumnavigate the globe by air. The other passengers were also journalists, except one who paid for his ticket himself and two US naval officers. On 8 August 1929, Graf Zeppelin flew back across the Atlantic to Friedrichshafen to refuel before continuing on 15 August across the vastness of Siberia to Tokyo , a nonstop leg of 6,988 miles, arriving three days later on 18 August. Dr. Eckener believed that some of the lands they crossed in Siberia had never before been seen by modern explorers. After staying in Tokyo for five days, on 23 August, the Graf Zeppelin continued across the Pacific to California flying first over San Francisco before heading south to stop at Mines Field in Los Angeles for the first ever nonstop flight of any kind across the Pacific Ocean. The Pacific leg was 5,998 miles and took three days. The airship’s final leg across the United States took it over Chicago before landing back at Lakehurst NAS on 29 August, taking two days and covering 2,996 miles. The flying time for the Lakehurst to Lakehurst legs was 12 days and 11 minutes. The entire voyage took 21 days, 5 hours and 31 minutes including the initial and final trips between Friedrichshafen and NAS Lakehurst during which time the airship travelled 49,618 km whereas the distance covered on the designated “Round the World” portion from Lakehurst to Lakehurst was 31,400 km.